Kate’s “big girl” room is a big thorn in my side. Vinyl blinds turned into a DIY blackout (polka pot) roman shade. 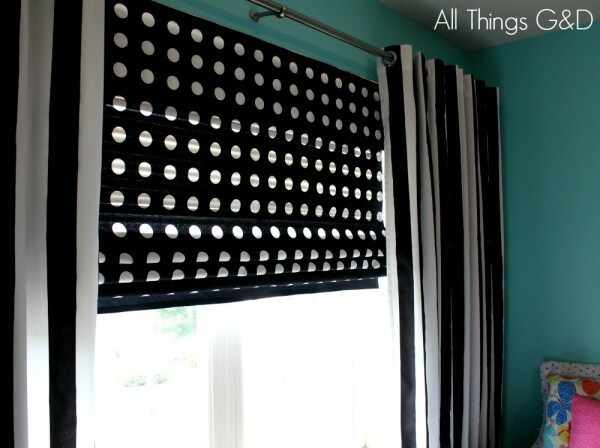 I was so proud of all the money I saved from repurposing the existing mini-blinds that originally hung in this window, turning them into a cute and functional DIY roman shade, complete with polka dot fabric and black-out liner – until they broke. I could’ve restrung the cord for a quick fix, but a bad idea is a bad idea no matter how many times you try to put a band-aide over it. 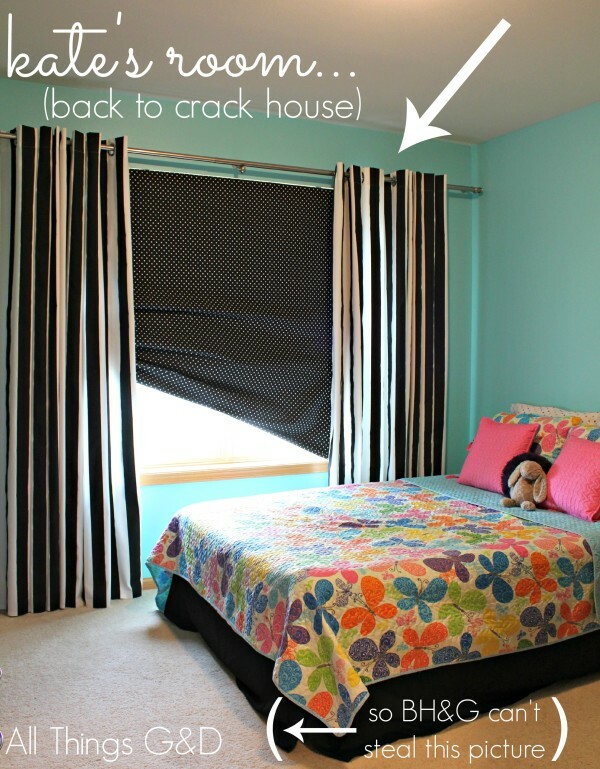 The problem wasn’t the cord – the problem was all those tutorials I’ve seen online and splashed all over Pinterest for “how to make DIY roman shades using mini blinds” were for small windows (here’s a great one from Jena at Involving Color if you’re interested in checking out my original technique). I was dealing with a very wide window (57″), and trying to get away with using only 8 flimsy slats in the back for support wasn’t working. I needed to try something new. I scrapped my original mini-blinds turned “crack house roman shade” and grabbed the last remaining set of untouched mini blinds in our house from our guest room. 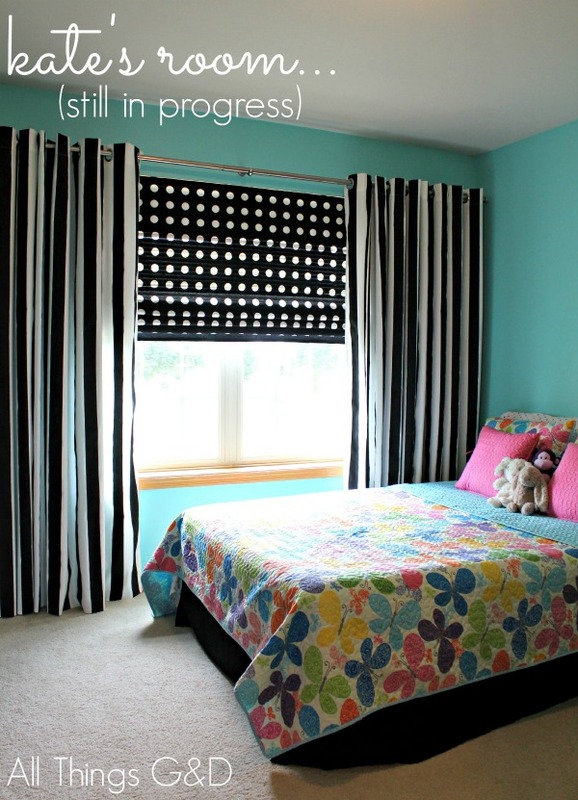 During my last trip to IKEA I found some gorgeous black and white polka dot fabric that I knew would look even better in Kate’s room than the existing small print polka dots I had used. An added bonus? This fabric was a little thicker so it would block more light, which meant I could get away with not adding a black-out liner this time, saving my blinds from that extra weight. 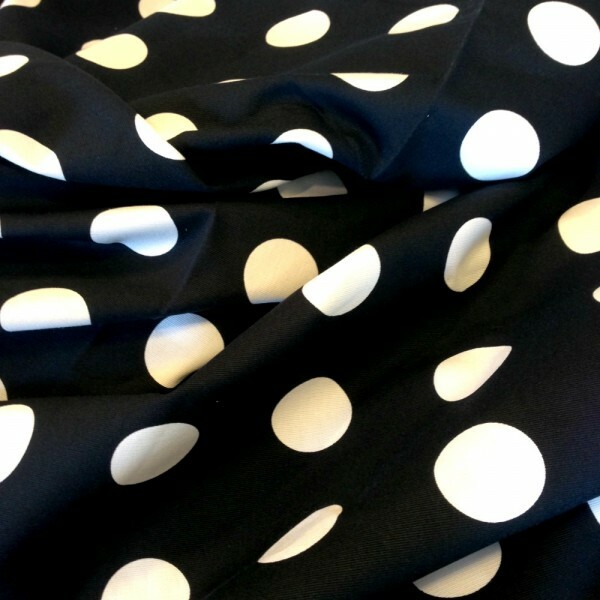 Love this black & white polka dot fabric from IKEA! This project was a lot of trial and error (and as fate would have it, I took more pictures of the errors), but eventually I figured out the best way to do it – which, not surprisingly, was also the simplest way to do it! 1. Start by measuring the width and length of your blinds. For this step, measure your mini-blinds from the top of the very first slat – not the top of the entire unit. We will not be covering up the top piece of the blinds that mount to the window in this step – we’ll do that at the end with a separate piece of fabric used as a valence. This will allow you the ability to use the pull cord to lift and lower the blinds without having to move it to the back or cover it with fabric. The blinds I borrowed from the guest room were actually shorter than the length I needed for the window in Kate’s room, but there’s an easy work-around for that (detailed in a later step). If that’s the case with the blinds you’re using then be sure to measure the length of your window instead, so fabric completely covers your window opening when your blinds are closed. 2. 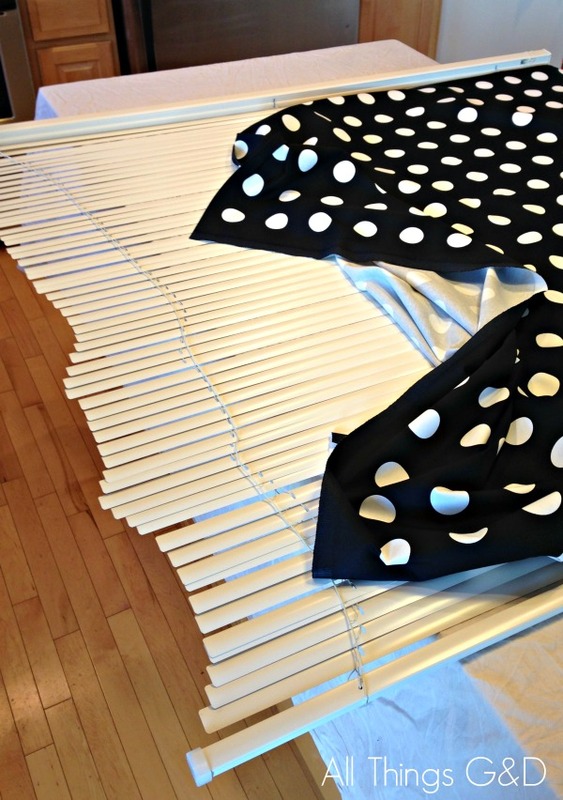 Iron your fabric and then trim it to fit your blinds/window, allowing extra fabric all around for a seam allowance. For example, if your window is 55″ wide you’ll need to cut your fabric 56″ wide, allowing you to do a 1/2″ hem on each side (adjust measurements according to your hem preferences). 3. Hem all sides of your fabric using an iron and steam-a-seam fusible tape. Time Saving Tip: Consider the selvage edges (the factory finished edges) of your fabric and see if they can save you the trouble of hemming a side or two! If the width of your fabric matches the width of your window (luck you!) and the sides of your roman shade will be covered by curtains, use the fabric’s selvages edges as your sides and there’s no need to hem those sides. Or, use the selvage edge of your fabric at the top of your blinds since that edge will be covered by your valence! By now you should have one large rectangle of fabric, hemmed (or finished) on all sides, that fits perfectly over your mini-blinds, starting from the top slat. It’s tricky when you’re working with all of the mini-blind slats using this method (versus cutting the ladder cord, removing excess slats and placing your remaining slats exactly where your fold needs to be) to determine which slat to use for your fold – but eventually I figured out a pretty fool-proof way! Measure and mark fabric to determine where your folds are going to be. 6. Lay your mini-blinds out on a flat surface, face up and pop off the plastic stick piece that turns your slats to let more or less light in; you no longer need this. If you haven’t already done so, give them a good wipe down with a wet cloth to remove all the dust and grime. You want to have nice clean slats for your fabric to stick to once you start gluing. 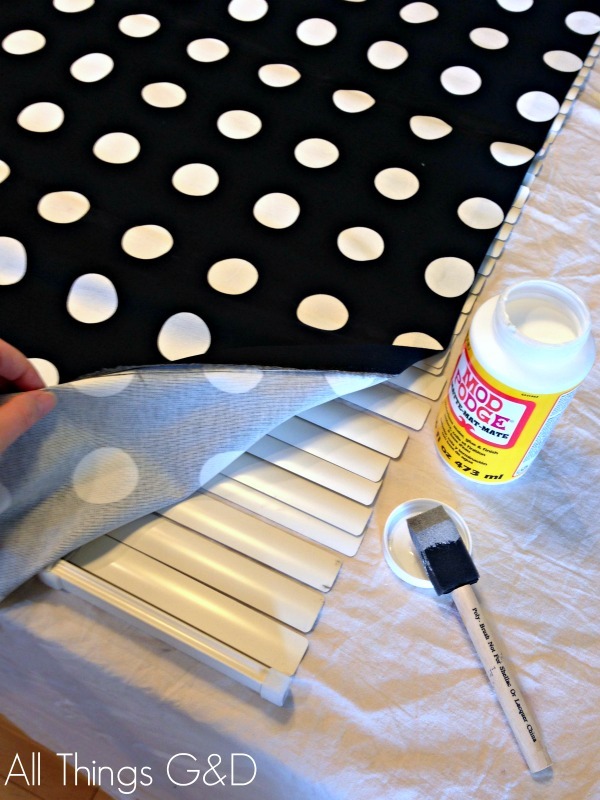 Going rogue with my mini-blind/roman shade tutorial using (gasp) all the slats! 7. 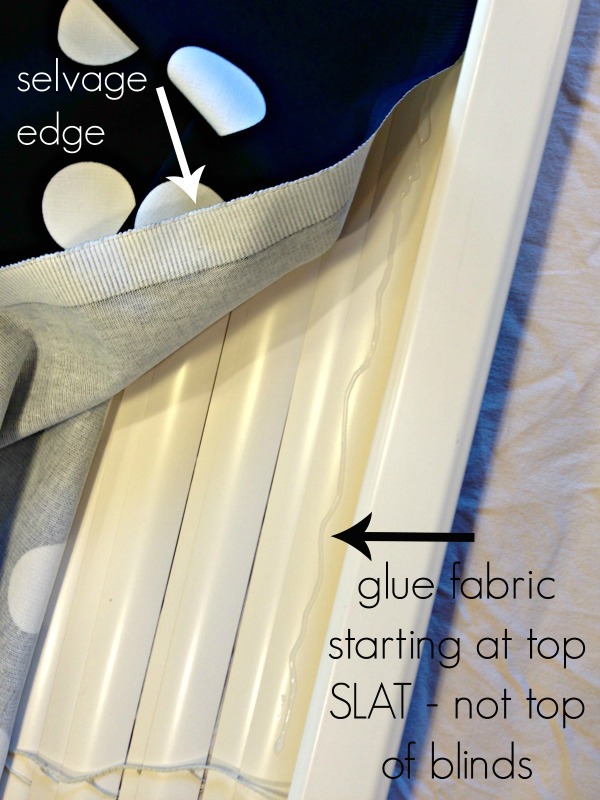 Lay your fabric, face up, over your mini-blinds and glue the top of your fabric to the top slat of the blinds, with the rounded up side of the slat facing up. The picture below shows my first attempt using tacky glue, but that didn’t hold up very well. The next day I re-did it using Mod Podge and a foam brush and that worked great so that’s the technique I recommend). Be sure not to get any glue on or near the pull cords as you’re doing this step! Note: I used a black marker to mark my blinds, which luckily turned out okay since I was using black fabric, but it definitely would have bled onto a lighter colored fabric once I applied the glue, so learn from my trial! Your safest best is to use a piece of tape or something you can easily remove and that won’t potentially stain your fabric. 9. Once all your slats are marked to correspond with your fold lines, remove your blinds from the window and return them to a flat surface. Lay your blinds down fully extended, all rounded up sides of slats facing up. 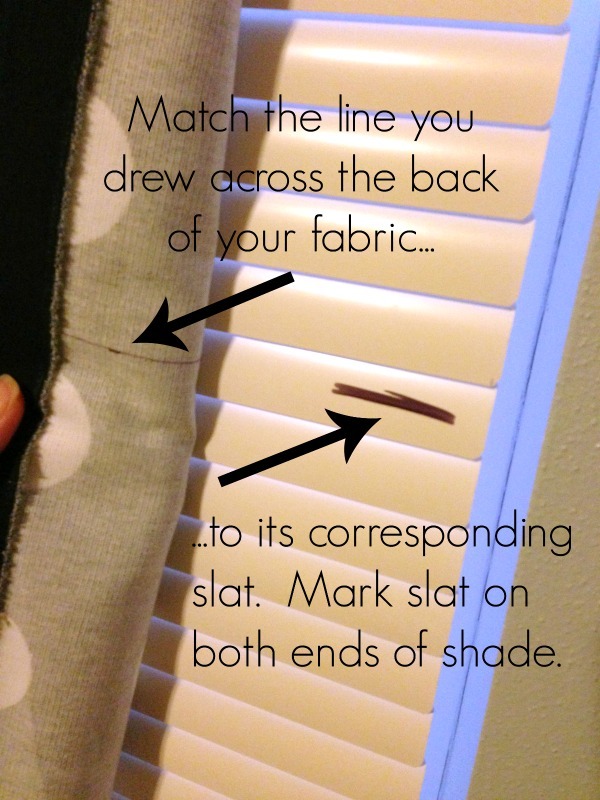 Starting at the top of your blinds, create your first fold by applying Mod Podge glue (using a little foam brush) to the rounded up part of the first slat you marked, making sure not not to get glue on or near your pull cords. Once the glue is applied, quickly smooth your fabric over the slats, adhering it to the newly glued slat. You want to take care at this part to make sure your fabric is nice and smooth and even across your blinds. Continue working your way down, gluing each marked slat and smoothing your fabric over it, until all marked slats are adhered with fabric. Don’t worry about slats peeking out from the sides as you’re working like you see in the picture above. As you’ll quickly discover once you start this project, mini-blind slats move around A LOT. It’s hard to keep them lined up when you’re working on a flat surface, but as long as you’ve followed all of my steps, and the slats and fabric ends that you’re gluing match up, your blinds will hang perfectly and be covered completely by your fabric. 10. Lastly, cut and hem a strip of fabric for your valence (mine is the width of the blinds and about 10″ tall), and adhere it to the top bar of the mini blinds using Mod Podge and a foam brush. And that’s all there is to it! 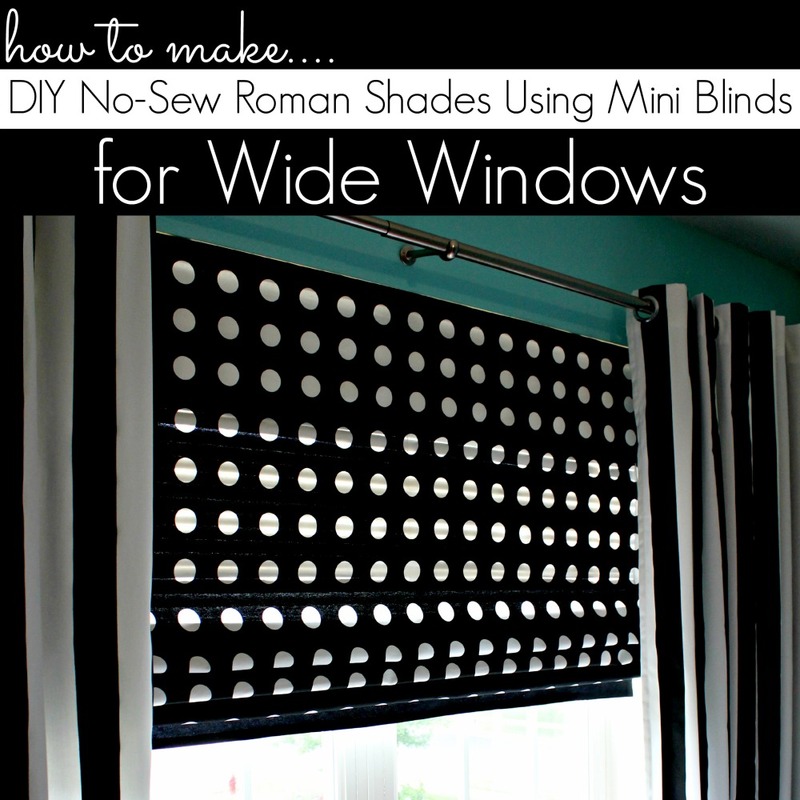 You now have a beautiful new set of DIY roman shades using plain old mini-blinds, that will work for your wide window! Thank you so much, Jena! I really liked the tutorial you wrote up (and recognize you, of course!) so when I was searching for “traditional” tutorials to link up to you were my favorite choice! You’re so kind to return the favor – thank you! Thanks for the step-by-step tutorial! I think the bigger “polka pots” look great! Enjoying the progess on Kate’s big girl room — especially as I starting planning one for my 2 year old. Thank you, Carla! I am loving the bigger polka dots! I think those other blinds broke for a reason – an opportunity to do it better! I’m so happy to hear you’re enjoying the progress of Kate’s room because it’s in for a major overhaul over these next few months! I’m so excited to tackle it and share the progress!! Good luck to you with yours! Do you have any ideas in mind yet? Thank you. I Ave wide windows, and now I can make a roman shade like you did without it being too heavy. Thanks girl! You know BH&G is ALL OVER these awesome crack house pics. I’m sure their people are trying to figure out how to call my people as we speak. I love the black and white with all the other colors. If my 4 year old would have let me do that, I probably would have gone that route. I’m still thinking about it for a rug because the pink and white Moroccan tile rug on Joss and Main is always sold out by the time I get over there (even if it is just minutes after posting it) and the Pottery Barn version is too expensive! Love the polka dots too! Thanks Megan! That’s too bad about the Joss & Main rug. I haven’t even started considering rugs for Kate’s room, but I know she’ll only have one criteria: soft. I hope you’re able to find something you like for your little girl soon! Great tutorial! And great shades, love the black and white! Thank you so much, Melinda! Hi Rissa! Thank you so much for taking the time to say hello. So happy to have you as a new reader! I love the look! How does it look from the outside of the window? Can you post a picture? Thank you, Joanie! From the outside it just looks like a window with vinyl blinds. I happened upon your site, and loved it. 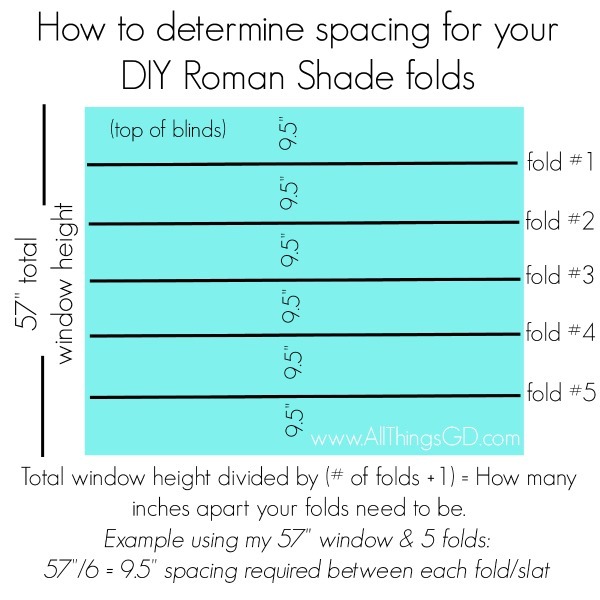 I saw the idea of turning mini blinds to roman shades on BH&G, but they didn’t show how, so I searched the web and found you! Your step by step is great, thanks. I am a DIY’er for everything, and I hate to throw anything away if it can be used in another way. I will be bookmarking your site. Again, thanks! Do you think that this method would work on the ugly cellular blinds that already hang in the windows? It would be nice to use these because we already have them and they already have the brackets mounted! However when they are up the folded edge is the only presenting surface meaning I could only glue the fabric to that narrow strip. Any suggestions? I’m so sorry Dawn, I’m not familiar with these kinds of blinds. If you plan to get rid of them it’s certainly worth giving it a try to see. Good luck to you! I’m a little confused….are you folding the fabric where you glue to the slat? Or is it just glued at the marked intervals? Love the tutorial. Great question, Kim – it’s just glued at the marked intervals. No folding necessary. I was confused too, glad you cleared that part up. So happy I found you in time, was about to throw out the mini blinds. I’ve always loved the roman shades, but couldn’t get over the cost. Doing some of my rooms in the black and white also. I am doing this with the mini blinds already on our window. My kids broke 13 in a row & I’ve had them pulled up ever since and put up some curtains up for privacy. Now I am finally ready to try this. I am not going to leave all of the slats in like you did. I untied & slipped out the three “pull up” cords on all of the slats except the top & slid all of the slats out that I didn’t mark as needed. With my wide window, my hope is that my ladders help keep the blinds sturdy (thanks to your post) & that the layer of fabric won’t be too heavy now that the other slats are out. I rethreaded the 6 or 7 slats & tied the ends again with the bottom all put back together. Now to piece my fabric together & glue it all up! Thanks for the inspiration. Sounds like a great plan, Michelle! I hope it works out great for you and your kids! I made these for my two living room windows that are about the same size as the window you used. I repurposed my old drapes and added a lil extra embellishment. So putting this together was fairly easy. I followed your tutorial, which was so easy to follow, and the final product came out really nice with the exception of one detail. Even though my drapes were lined, the glue would bleed through some spots and dry that way. Its not too noticeable unless I point it out. So my two cents—When choosing a fabric, choose a thicker fabric that wont be too heavy but thick enough to hold glue on a side without soaking through. A darker fabric would also help hide any glue that may bleed through. Otherwise, this was easy and exactly what I wanted without the big price tag. Thank you for sharing your creativity!! Excellent tip, J. Griffin – thank you so much for sharing your results! Very interesting! I wonder why the others take the slats out, then… I would think this would add more privacy/filtering as well as strengthening it. Is there any reason to not do it this way even if you have a smaller window? Or is it that some people like the aesthetics of the fabric backing from outside more than the mini-blind backing? We are about to do this and love your different take on the project! I think its an aesthetics thing, smp. It does look like mini blinds from the outside of her window when the door is closed, so if you don’t like that look I can see why you may want to remove the slats for smaller windows and go for more of a roman shade look. I’m all about function with this window though, so I don’t mind the slats being visible from the backside. Good luck to you with your project! 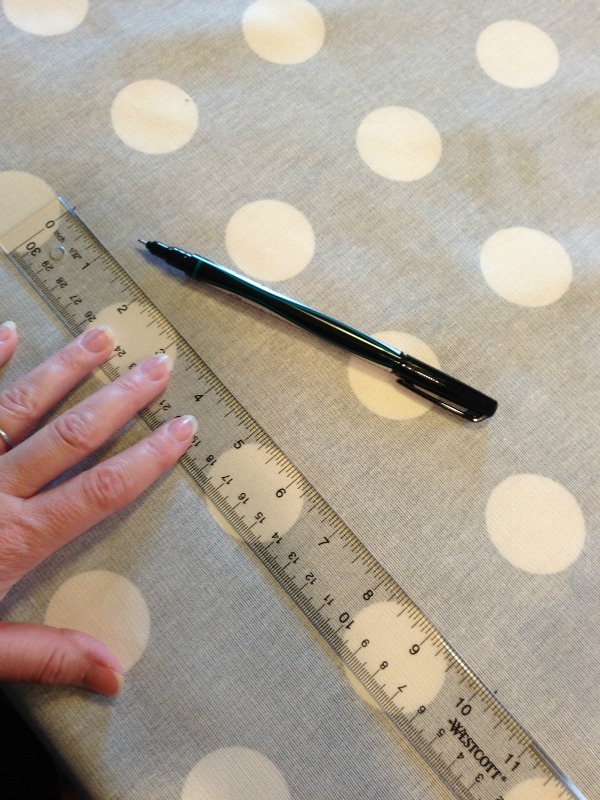 I have a question–how do you determine how much length of fabric you need? 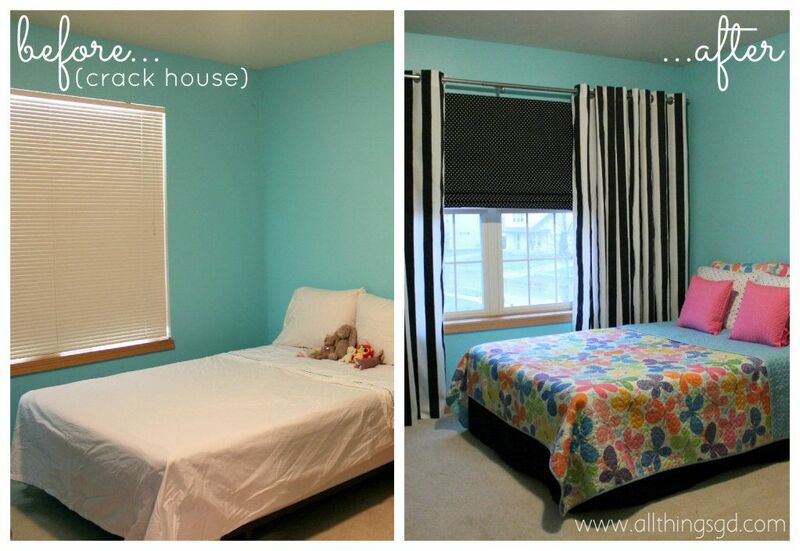 Do you allow extra length, or does it match the length of the blinds? Thank you! I think I’m doing something terribly wrong. When I adhere my fabric to the blinds with mod podge and let it dry for 30 minutes. It’s attached but can pull off extremely easily. I only did the top slat and it pulled off as I was hanging it back up. Seems like it should stick better if it’s going to be going up and down over and over again… am I missing something?? Yes, it should definitely be sticking better, DeeDee. I would first make sure that the surface of your blinds that you are gluing to is completely clean and dry. Use a good cleaner that will remove any unseen grease or oil that may have built up. Maybe go over it all with rubbing alcohol too after you clean it. Then try your glue again. If that still doesn’t work I could recommend trying another kind of adhesive. Good luck! As a senior who has more time than money, I love your work. I plan to try this very soon. Thanks for this idea. Thank you so much, Carol! Good luck with your project – I hope it turns out great! This tutorial will work for either. I was concerned about the adhesive fabric to blind. Glad to hear it works for either. I’m pretty sure our blinds are metal, and I’m assuming vinyl would have better adhesion, so I think you’re good no matter what you have! Thanks for posting this! I had seen blogs on how to do this, but they all ruined the blinds. After seeing your post, I realized it was probably possible to do this without damaging the blinds at all! I followed your instructions, but rather than glue the fabric to the blinds, I cut 2 small slits into the fabric to thread ribbon through in order to tie the fabric to the blinds. I ended up doing 4 ties across on each slat that I wanted to connect the fabric to, and it worked perfectly! We’ll see how long it holds up without fraying, but right now it looks great and doesn’t ruin the blinds for when I move out of the rental! Yay! I love it! What a great solution, Bekah – love that idea! I’m so glad it worked out so well for you. Thank you so much for sharing! This is great! Love the option of change later and hope this works here as well. love what you have done here… you have inspired me!!! what do the blinds look like from outside of the house? Thank you, Michelle! The blinds look very similar to mini blinds from the exterior although there is not as much distinction/contrast between the slats as they are covered in fabric. I so love this! I will be trying it and hopefully it will be successful! My pleasure! Good luck to you! This is wonderful! Would this be just as effective with faux wood blinds? The ones we have are 2″ slats. Thanks. Yes, the process would be the same and the blinds would function the same, although they may feel heavier and be a little harder to open depending on the weight of the fabric you select. With wood blinds you likely do not need to keep all of the slats in place for stability, so you may prefer to remove a few of them so the blinds aren’t as heavy. Totally personally preference! I don’t know if anyone has said or done it with velcro instead of glue. But that is what I’m doing to do. That way I can take it down to wash them. But make sure you wash your material first before you do any measuring and cutting. Because of shrinking. Just put the velcro where you would put the glue. Also Bekah said about using ribbon is a very good idea. You can still take it down and wash it. Thank you for all the good ideas. I just love it. My main concern with this method was also the cleaning of the actual blinds. How did you attach the velcro to the blind itself? Do you think faux wood blinds would work too? Yes, the process would be the same for wood blinds, and the blinds would function the same, although they may feel heavier (since wood blinds are heavier) and be a little harder to open depending on the weight of the fabric you select. With wood blinds you likely do not need to keep all of the slats in place for stability, so you may prefer to remove a few of them so the blinds aren’t as heavy. Totally personally preference! Best tutorial I have seen this far. Doing these in all the rooms in our house. Great custom look and blinds are $5 at Home Depot on the bottom shelf. Buget friendly too. Love it!!! Thank you so much, Dawn! 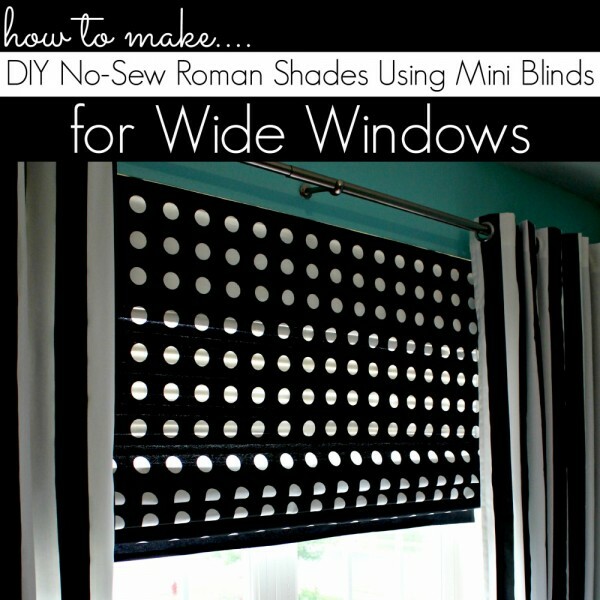 So happy to hear you found this DIY Roman Shades tutorial helpful! I’m having a problem pulling up the new shades…aren’t pulling up evenly. I love the look, but need to pull them up! Can u give me any suggestions? Text me at please! Hi Pat. I would recommend taking your blinds down and laying them out on a flat surface, extended out to their full length. Once you do that, look for any gaps or pulls you might have with your fabric. It’s hard to say what the issue may be without seeing them in person but you may have gotten some glue on your cords or the fabric may have been adhered unevenly. Laying your blinds out flat should help you find the problem and resolve it. If you cannot see the issue while they blinds are fully extended, start pulling the cord to open them (while they are still layed out on a flat surface) and notice when and where they start to get uneven – that’s your problem spot. I hope this helps! Hi Dusty! Thank you for this! I plan to use this for a few sets of blinds to be used outdoors, so I may want to cover both sides (would need to make a valence for only one side)…do you know if that’s possible to work into/add to this? Thanks so much! I love this idea and am starting mine today! However, I’m not crazy about the idea of mini blinds in my front windows so I was also thinking of covering both sides. Do you think this will affect the operation of the shades or even be too heavy? I’d love to hear your thoughts. Hi Denise, I can’t think of any reason why this wouldn’t work. If the blinds + two layers of fabric feels too heavy you could try removing a few of the slats (keeping only what you need for stability). Or maybe stringing another cord through the slats that can tolerate the extra weight? This sounds like a really neat project – I’d love to hear how it turns out if you give it a try! What if blinds r longer than window ? There are many tutorials online to shorten blinds; mainly youtube. These are great visuals. 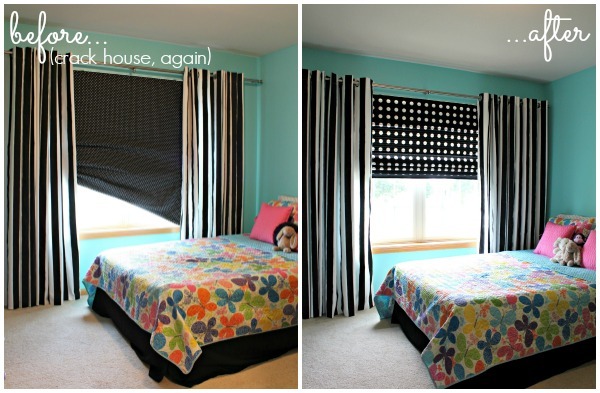 Ditto Laura – you can find tutorials online to shorten your blinds and then you can turn them into roman shades using this method. Basically the process is that you untie the strings below the bottom bar of your blinds, remove the bottom bar and set it aside, pull off any extra slats you no longer need, and then re-tie your bottom bar back on at the newly shortened position. Hope this helps, Heather! It worked out great removing all but 8 slats. I am making a basket out of the slats removed. So glad I searched for a DIY on a wider window. I’m going to try your instructions as this 2nd one is a 74″ wide blind. I’m so happy to hear this worked out so well for you and your daughter-in-law, Mary! The idea to keep the wood blinds up underneath and make the roman shades look like a valance sounds so pretty. Thank you so much for sharing and good luck with your 74″ wide blind! Hello, I keep coming back to this blog because it’s so easily laid out . My question for you is : I have windows that are 18 inches long.I love the light blocking of using all the slats. They are in my vintage trailer, tiny windows, but how do I know what the right amount of folds is? Do I do 5 folds or 3 ? What is too small and the final outcome is too bunched up.? I hope that made sense. Thank you so much for your reply in advance. Hi Dusty! I loved your tutorial! I’m in a similar situation. 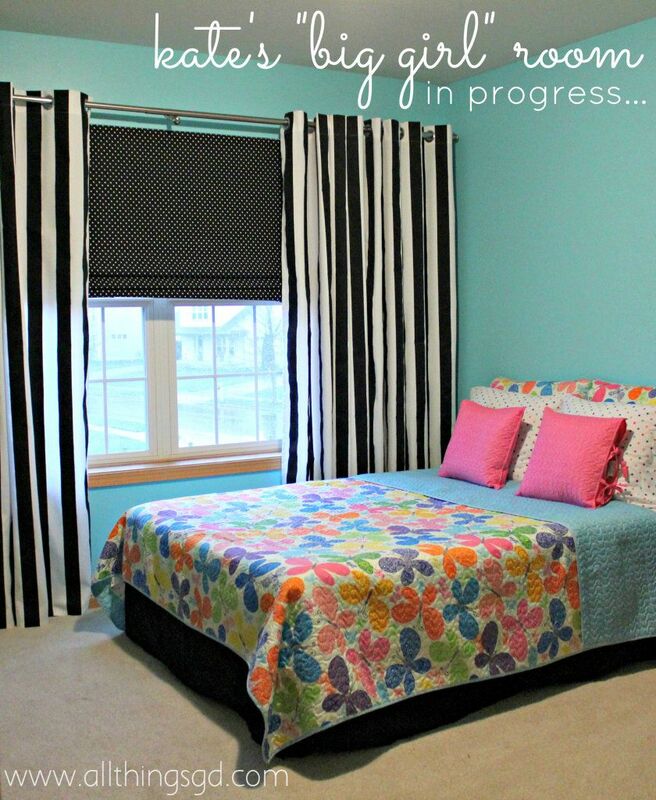 Just moving into a new house and wanting to get my 8 year old big girl bedroom set up. There currently is a honeycomb shad in the window in decent shape but it is the wrong color and old. The window is 72 inches wide and I’d love to put in a Roman shade but everything is so expensive for that width! I’m wondering if I can somehow make a honeycomb shade into a Roman shade or paint it??? Any suggestions?? I might attempt fabric spray paint if it was me; they have it at hobby lobby for 9.99 and use the 40% off coupon. Anyone ever tried this? I love the tutorial that you provided. After having my whole house painted, I decided to make a pair of Roman shades for my office. I did not want to having curtains hanging to add more dust to what is supposed to be a CLEAN room because of all the equipment, well anyway I followed the directions for one of the sites that have you remove all the slats. I did it, they look wonderful BUT I like your idea much better–looks much easier and you don’t have to take the blinds apart. Thank you so much for all the details, you crafty little devil. WOW I am so glad I came across your tutorial. I have a big window also, 58×58, and would have pulled out all of the slats except a few. This way that you have shown will balance out the weight. Thanks again. My pleasure, Melissa! Thank you!